Joyce Wanjiku Kairu once found herself on the streets of Germany after being lured to the country with the promise of a well-paying job. She tells LYDIAH NYAWIRA why she now helps care for the elderly in Kenya. When news of a frail 93-year-old woman from Amboni Village in Nyeri County was broadcast in the media, one of the first people to rush to her rescue was Joyce Wanjiku Kairu founder of Purity Elderly Care foundation. Wanjiku was outraged and heartbroken by the incident because this was not the first time she was caring for a defenseless elderly woman who had been brutalised or neglected in Nyeri County. For the past three and a half years, Wanjiku has dedicated her life to care and compassion thousands of lonely helpless and elderly men and women in Nyeri County. Her foundation has been in the front line of feeding the elderly, building shelter and providing them with clothes and medical attention through her foundation.However, for 42-year-old Wanjiku, life has been a journey filled with challenges that have seen her suffer and triumph in equal measure before she reached a turning point that would ultimately see her leave her comfort zone for the sake of the elderly. After high school at Othaya Girls School in Nyeri where she had spent all her life, Wanjiku left the country in 1997 for Germany, the plan was to get a better life with a well-paying job and a promise of a bright future. Like many in the diaspora, the then 26-year-old was being hosted by a family and was optimistic that a job offer would change her life. But after a week in her new home in Frankfurt , she realised there was no job waiting for her. The family asked her to go shopping in the local supermarket and one of the family members offered her a cold drink. “I lost consciousness and woke up in a brothel, I had been drugged and I had no money or way to get back home,” Wanjiku says. She says she was told that the only way she could earn money was to be a prostitute, she breaks off for a minute overcome with emotion then explains. “There was a German man who I was supposed to be sold to, I stole money from him, escaped and started living in the streets, homeless and hungry, I had no choice but to pickpocket to stay alive,” Wanjiku openly confesses. At night, I slept under bridges with other homeless people and during the day, I camped in a phone booth, which I often used to call home and ask for money. “I rationalised my stealing from people telling myself it was better than prostitution but to be honest, those were the toughest days of my life,” Wanjiku notes. She luckily bumped into a friend who got her a temporary place to stay. Wanjiku was in Germany for eight months before she returned home to her family, disappointed but not discouraged. “I decided I would not dwell on the past and started to save money. With my parents’ help, I was able to fly out to South Africa in 1998,” Wanjiku said. In South Africa, she was employed as data clerk, which allowed her to pursue her education at University of the Witwatersrand (Wits) business school. “I got a diploma in project management from Wits Business School and I was lucky enough to get a job at Lexxmark International as a project manager,” Wanjiku explains. Her life turned around, with what she can only describe as an opportunity of a lifetime. “I worked all over the world. I travelled extensively through African nations such as Botswana, Lesotho, Mozambique and Namibia,” Wanjiku narrates. She also got opportunities to travel all over Europe and the United States, Australia, not just to work but also to have fun. “I am a big rugby fan so when I had the chance to travel to watch rugby in New Zealand, I never missed the games. It was a very thrilling time in my life,” Wanjiku says. However, with a six figure salary and a lavish home and globe-trotting career, she lost touch with her family, and for 14 years, she did not have time to keep in touch. She notes that this is a problem because many people use it as an excuse to ignore their aging parents. “It’s easy to get absorbed in the day-to-day life experiences of work and a fast-paced life until tragedy strikes and makes us evaluate what really matters to us,” Wanjiku explains. For her, the news that her mother had been diagnosed with terminal cancer in 2010 was a big blow , but like many high-flying career-driven Kenyans abroad, she sent money and did not visit. She called home more often but each time her father asked her to come home and see her mother, she said she was too busy to get time off work. For a whole year she simply continued to live her life until she got the call that her mother had died. Unfortunately for Wanjiku, this was not her turning point, she kept on working until one day when she was jogging around her upmarket neighbourhood. Her jogging partner was hit by a speeding car and was killed instantly. “I was in shock at that moment. All I saw as my friend died in front of me was how my life was short and without purpose,” Wanjiku explains. For months, she tried counselling, took time off work and eventually quit her well-paying job and came back to Kenya in 2011 when she immediately set up her foundation. “I was regretful that I had not been there for my mother when she needed me and I decided to offer compassion, love and hope for other aging parents,” Wanjiku says. She named the foundation ‘Purity’ after her mother as a symbol of her mother’s struggle and need for care and moved to Mweiga in Nyeri County. “The first case I came across that broke my heart was of a 95-year-old woman who was so weak she could not leave her bed. To protect her from stray dogs, her neighbours used to lock her in her mud hut. The neighbours had made a large hole in her bed and mattress so she could pass stool into a bucket under the bed and she was covered in bed sores. Wanjiku gave her new bedding and brought her a clinical officer to clean her bed sores. Wanjiku also worked with two volunteer community health workers who cared for the woman every day. “She passed away 12 days after we intervened but what made me feel relieved was that her last days were spent in dignity, and with a feeling that someone cared about her,” Wanjiku said. 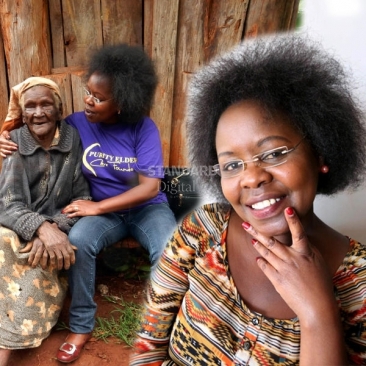 Since then, Wanjiku has dedicated her life to caring for the elderly. She is known to locals as a beggar for the elderly, a title she is not ashamed of as she constantly asks for money and food stuffs from strangers, business people and fruit vendors. She uses the money and donations to buy clothes, food, adult diapers, build homes, blankets and anything the elderly people in her care need. So far, the foundation funds home-based care for 29 vulnerable elderly people, they donate foodstuffs and clothes to more than 300 people a month, and have built shelters for seven elderly people. Last year, Wanjiku received the Humanitarian award on World International Women’s Day from Mrs Deloris Jordan who is basketball legend Michael Jordan’s mother.